Stereoping pointed out some interesting mods for this VCR-looking analog drum beast. Since I like the idea of saving kits i focussed on parameters like tune and decay for real-time control. Triggering those 5 voices by my modded TR-606 with multiple outputs. Great fun! Thx for the nice documentation! 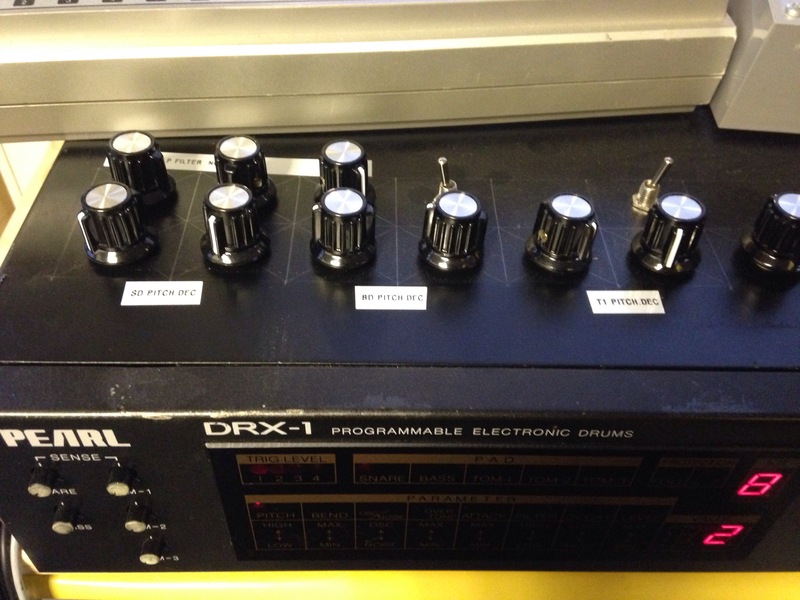 The Pearl DRX-1 has 5 Instruments which can be triggered by drum pads. Of course, you can also feed some trigger signals into it. All instruments have the same parameters and are therefore sounding identical, although the pitch ranges are a little different. Beside Bassdrum there is the Snare and 3 Toms. Each has its own trigger-in and an individual out jack, 6.3mm. If you do not use the individual jacks, all sounds are summed together to a stereo-out. Very solid, professional and expensive hardware. You have 8 kits to save your parameter sets. the kit-selection buttons recall the kits immediately, you can switch them live in the song to change the sounds. You can hear that in the video. To edit the sounds you select a pad (=sound), with two buttons (+/-) you select the parameter and with two other buttons, you can increase/decrease the value. The range is from 1-19 for all parameter. 2. Bend = the amount of pitch modulation, the pitch is also velocity-dependant. heavy hit=more bend. Only positive (piuuuu). 4. Overtone = WOW, I love this parameter! It adds some ring modulation sound to simulate the second drumhead of a tom. 5. Attack = Volume of Attack-Sound, a short enveloped Noise, not a Click. Makes the drum sound more defined and aggressive. 6. Filter = Lowpass for the Noise also dampens the Attack-sound and even the Oscillator. 7. Decay = with high settings, the sound is very long, 808-like. With the shortest value, the decay is still quite long. It’s because this unit doesn’t work with t-bridges like the 808/cr78/er-0/dr55 a.s.o. machines but with oscillators that get modulated by envelope VCAs like on the 909. It has 2×13900 (dual channel-OTAs) per channel. 8. Level = well ..